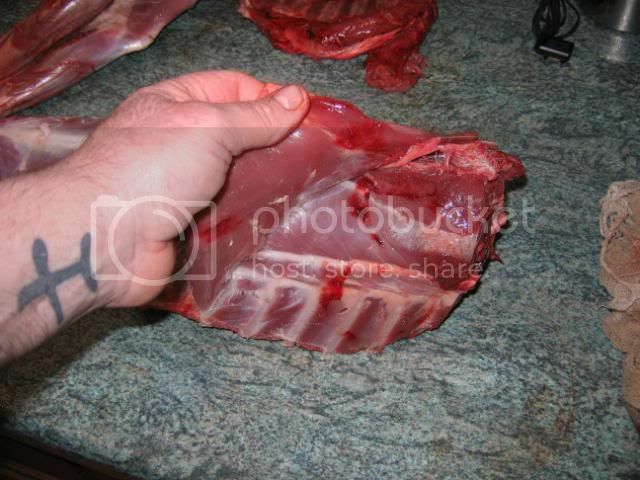 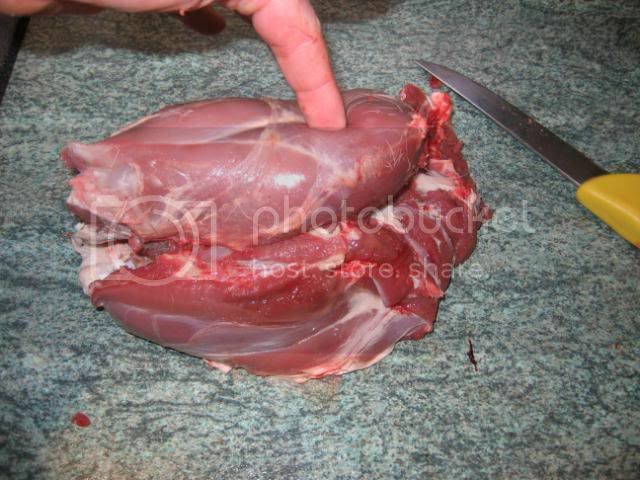 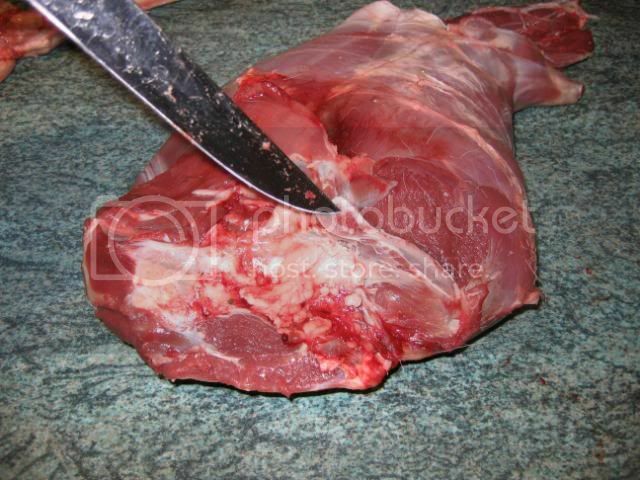 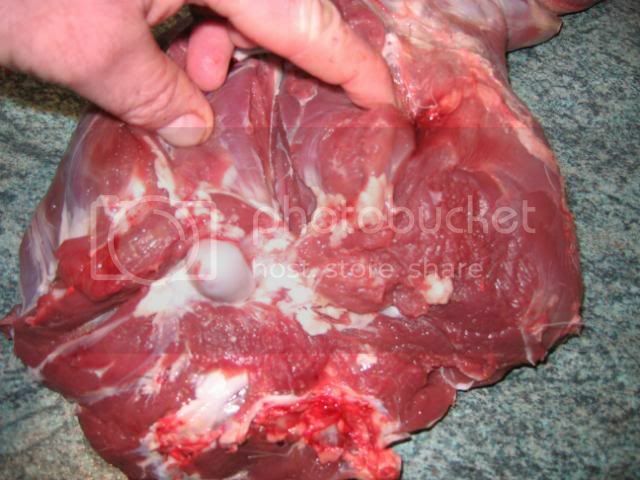 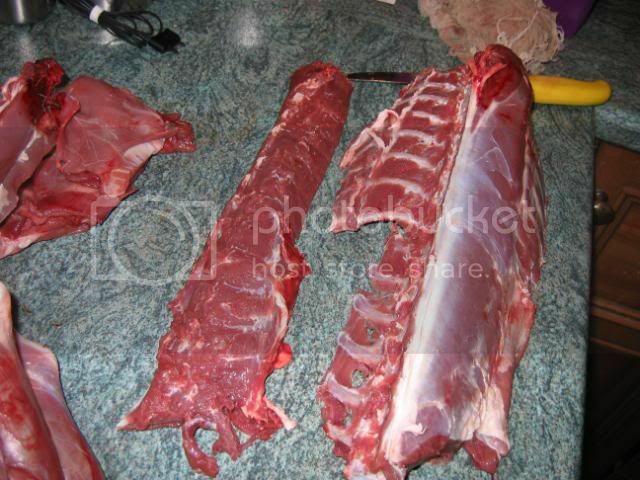 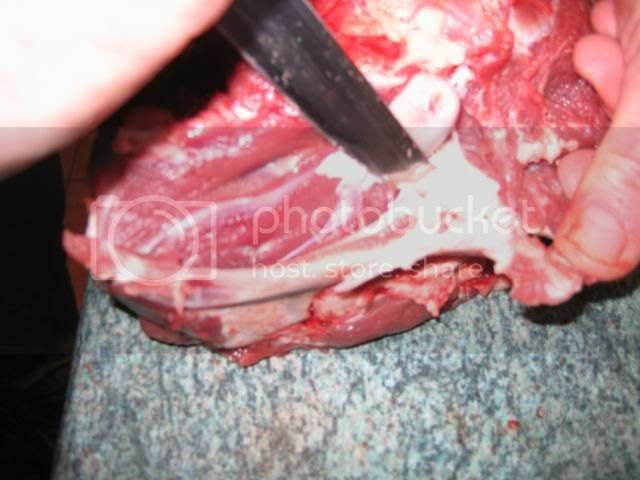 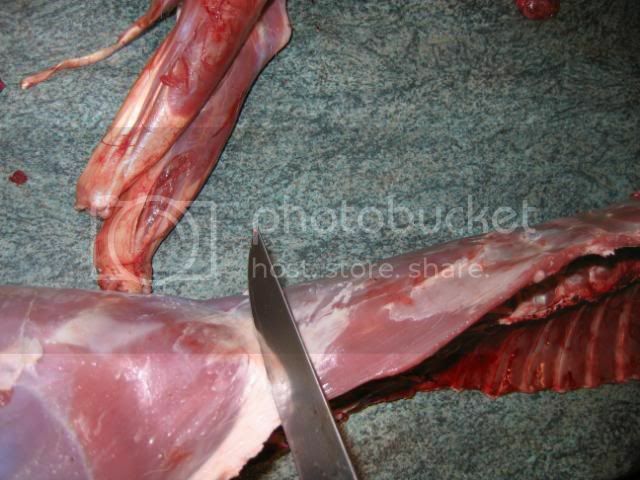 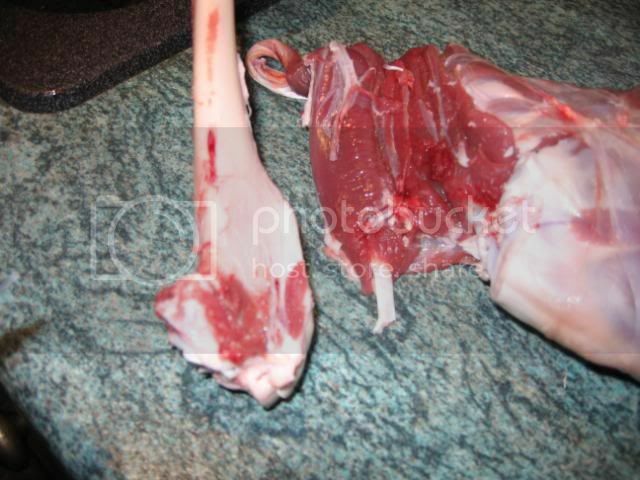 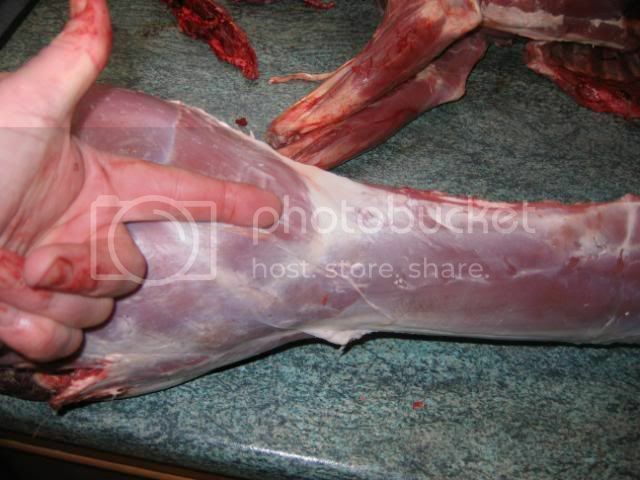 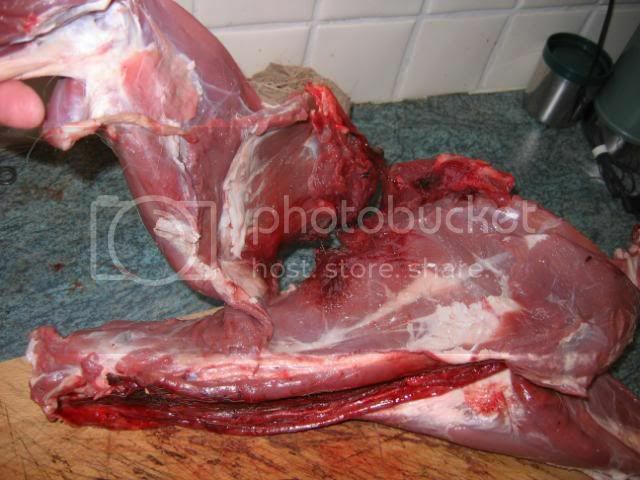 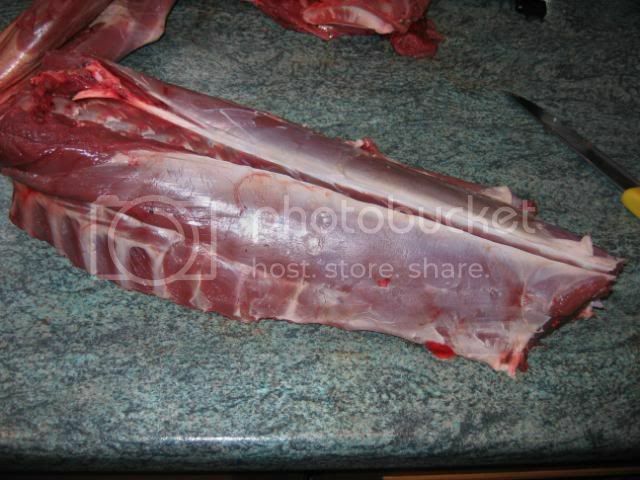 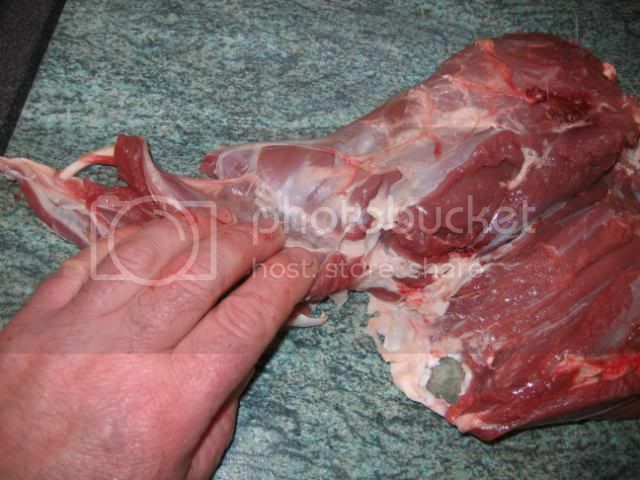 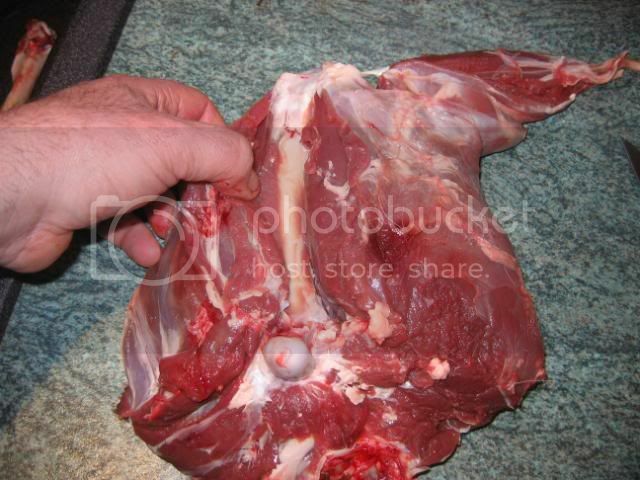 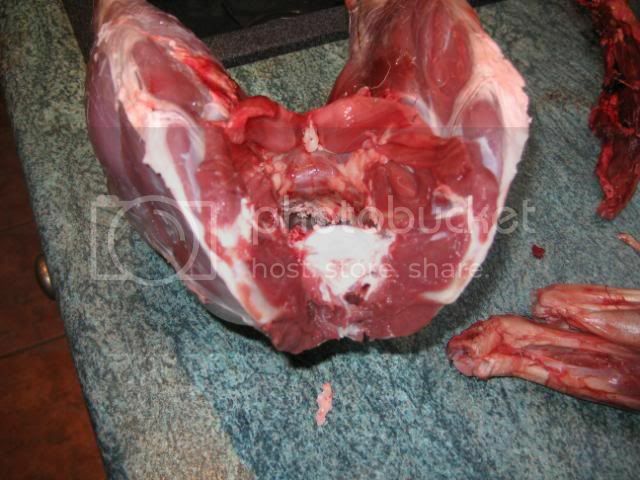 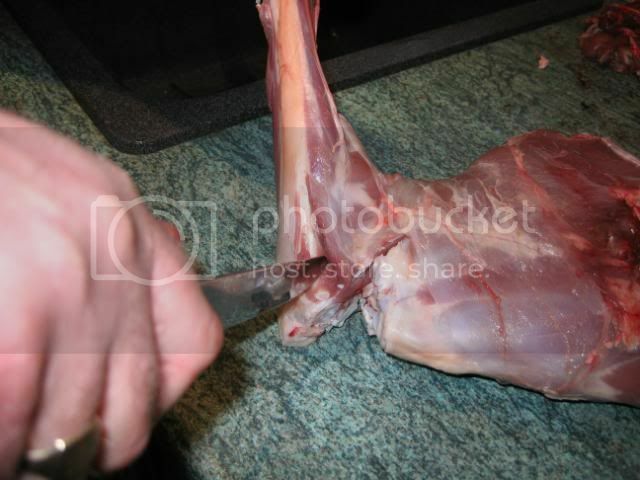 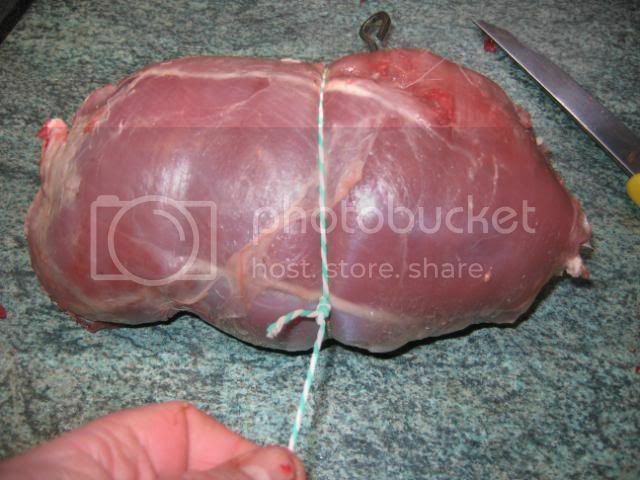 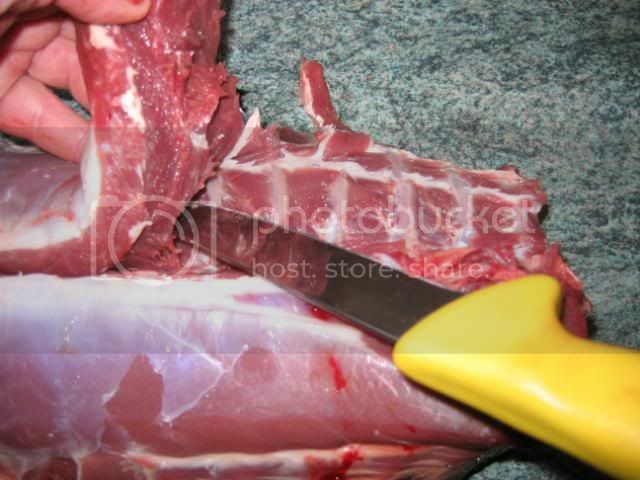 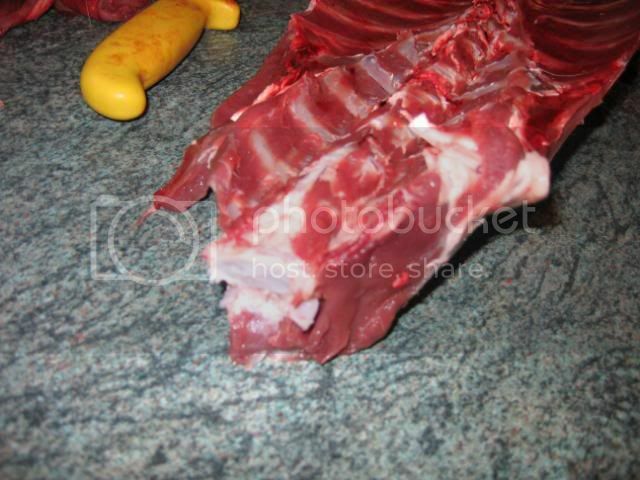 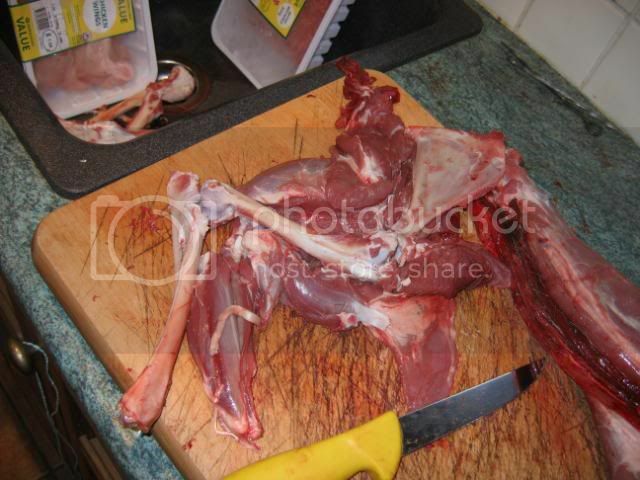 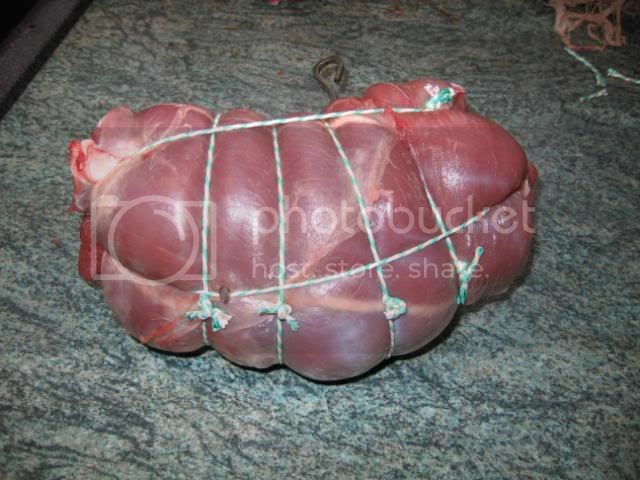 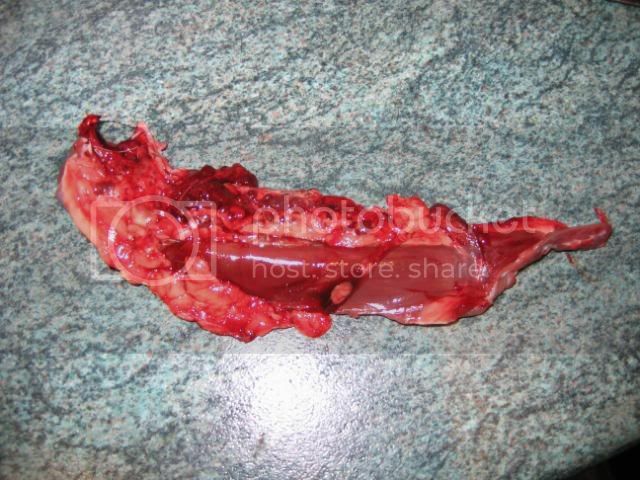 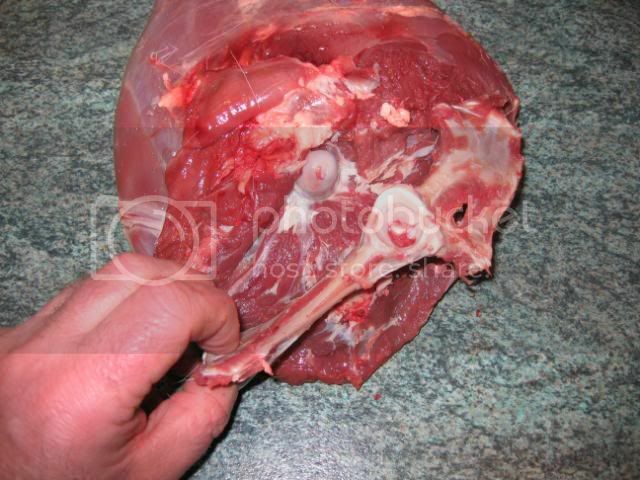 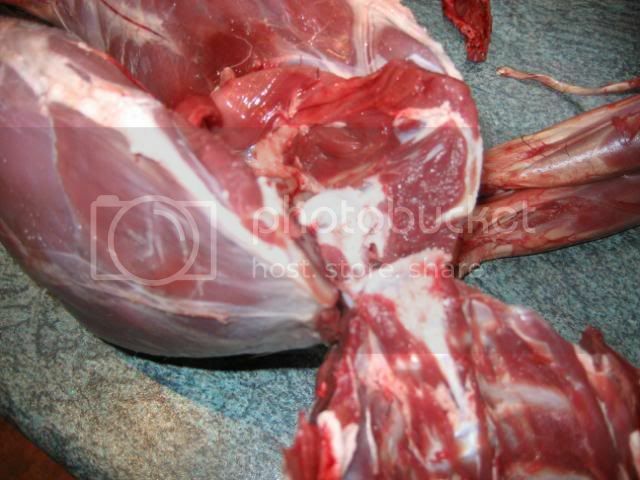 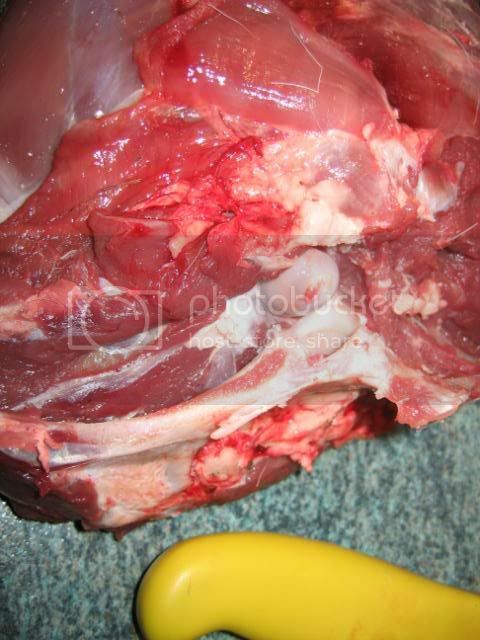 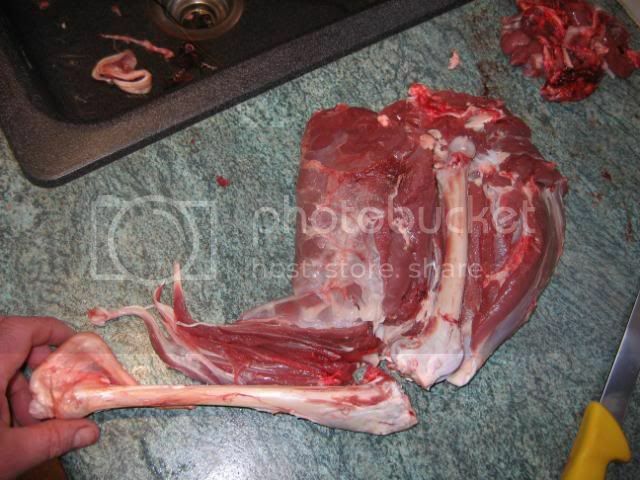 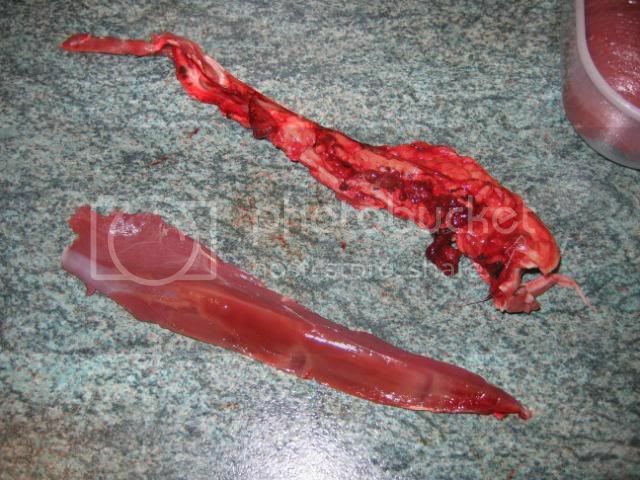 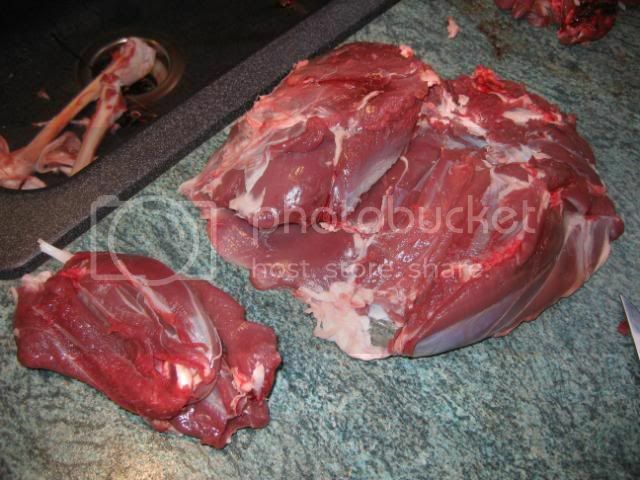 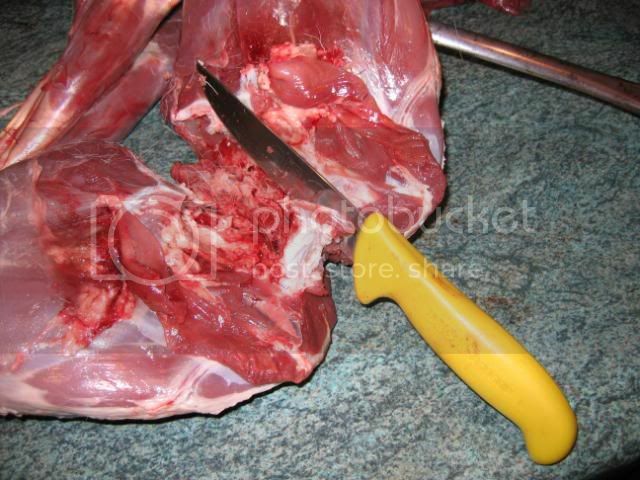 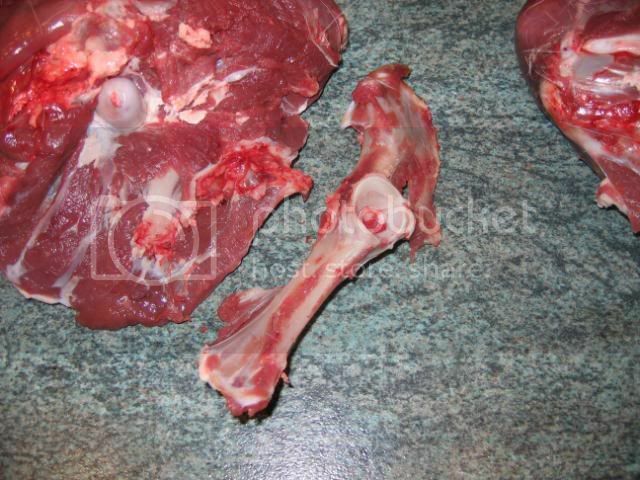 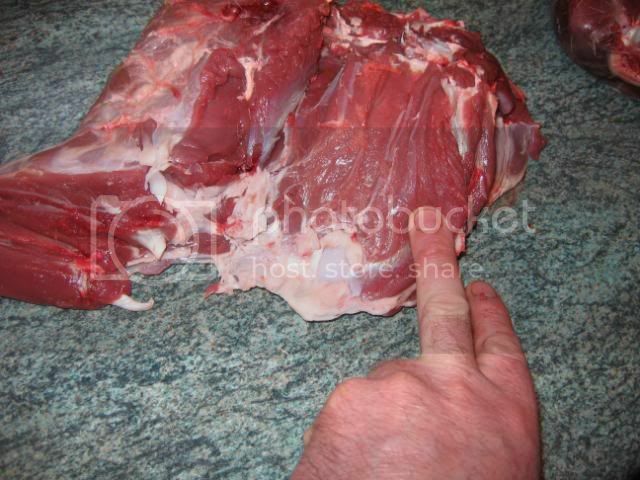 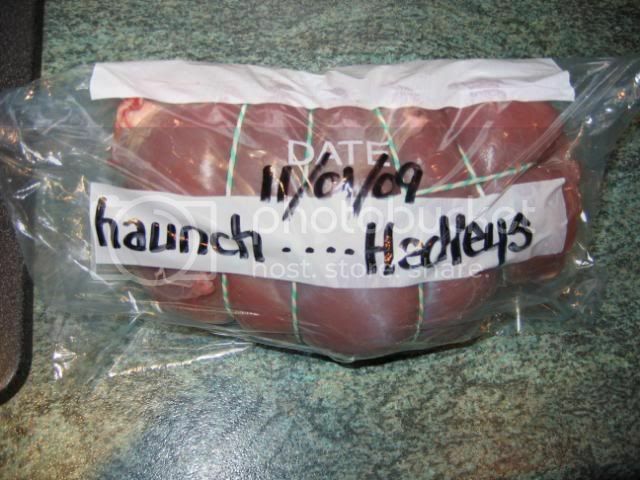 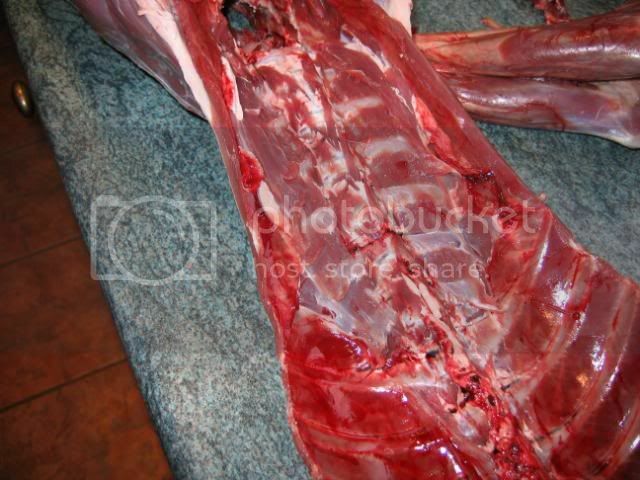 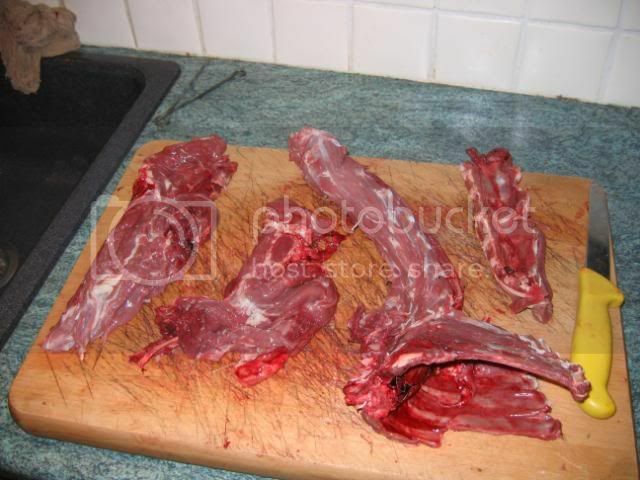 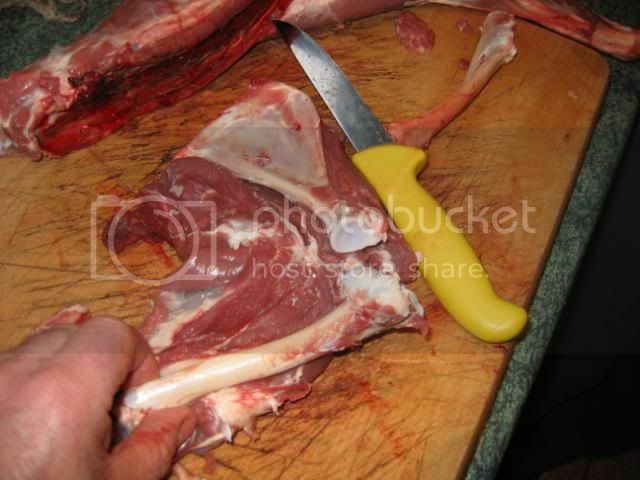 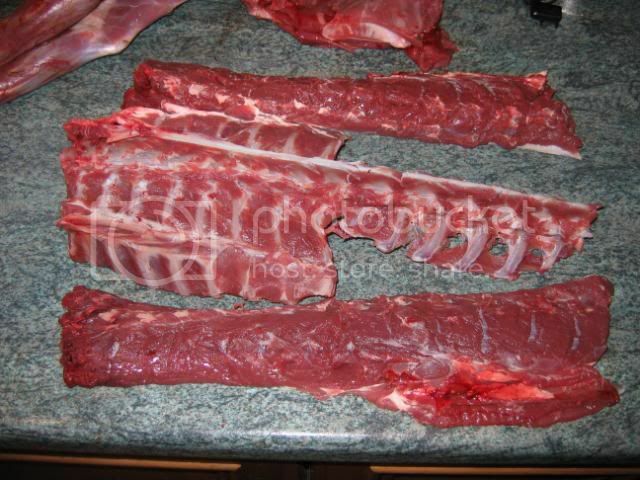 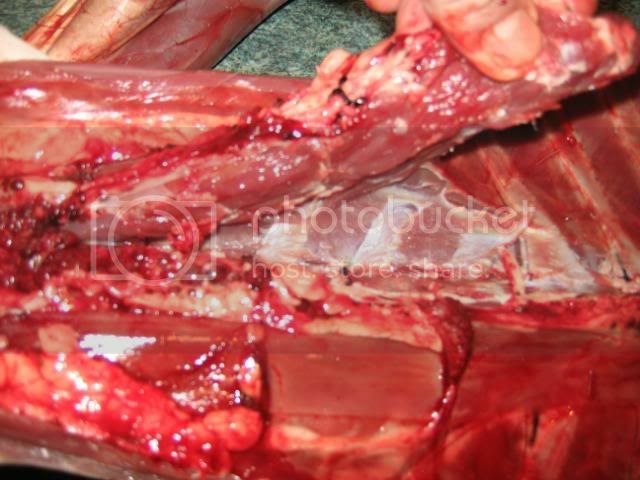 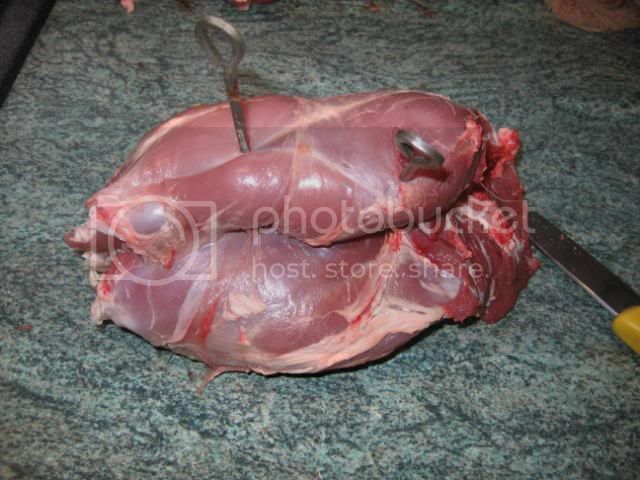 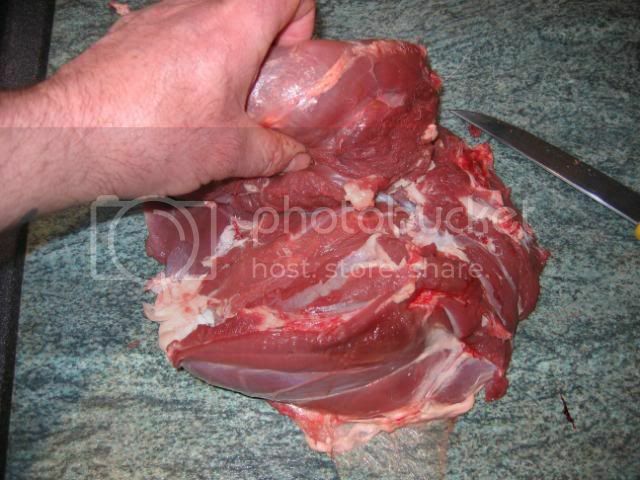 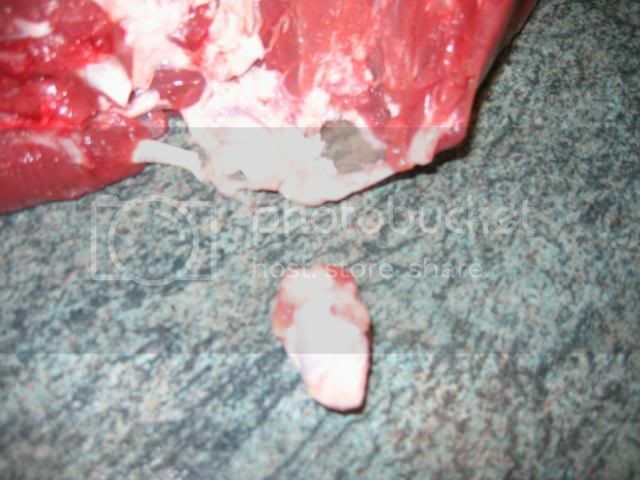 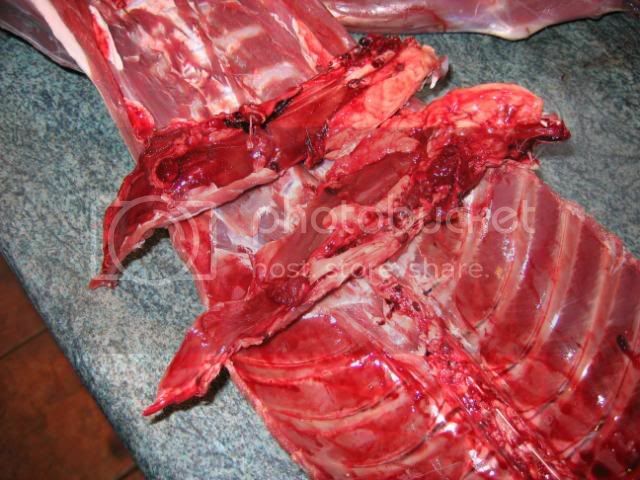 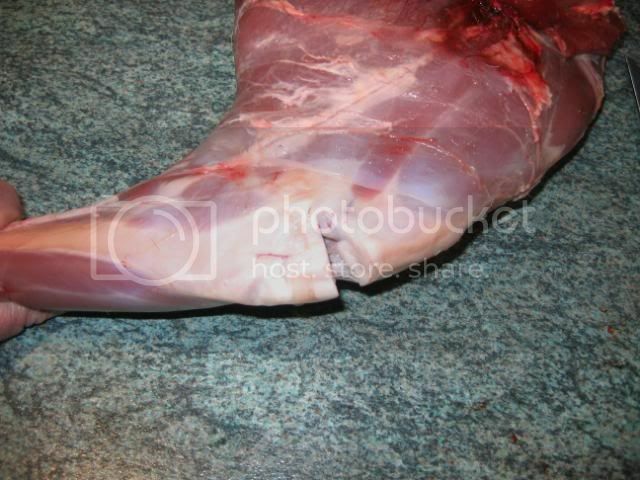 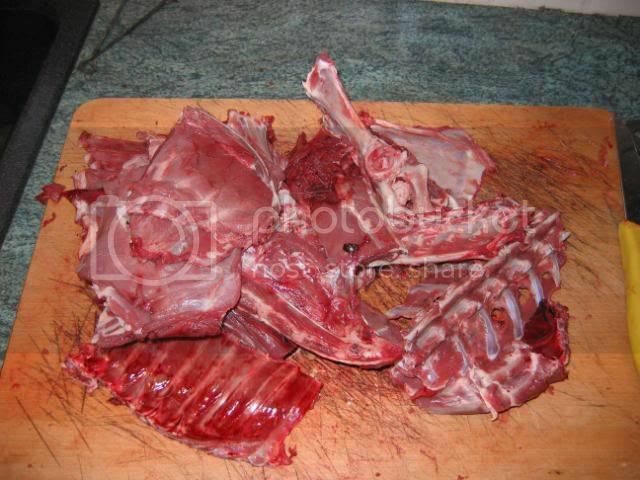 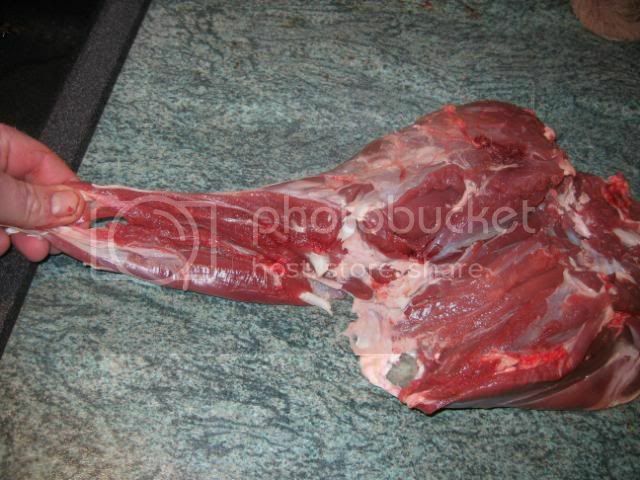 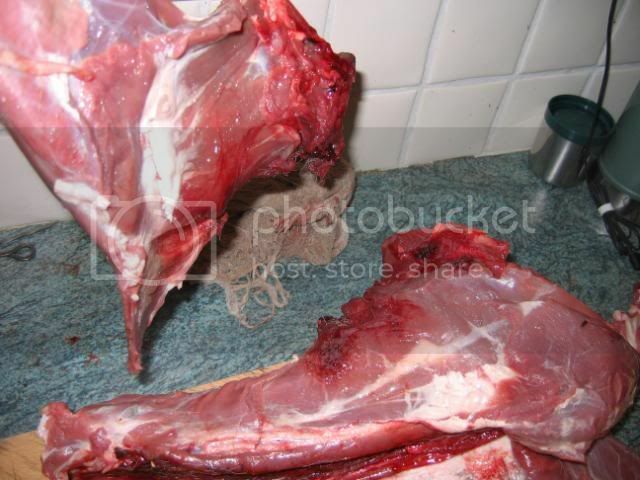 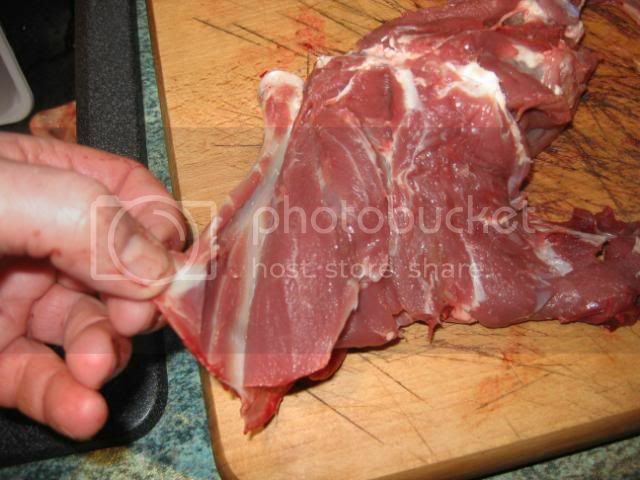 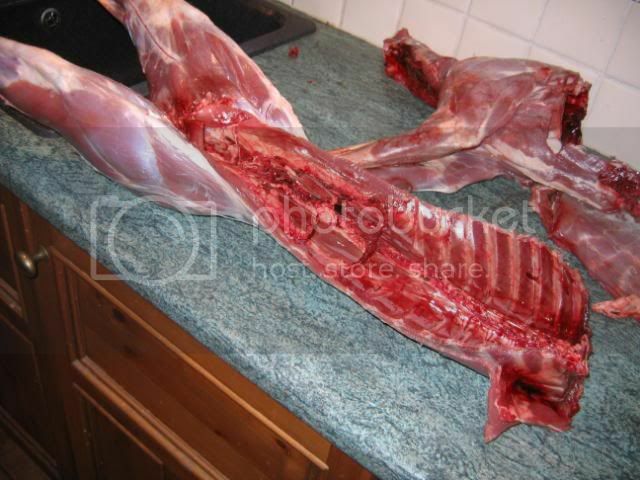 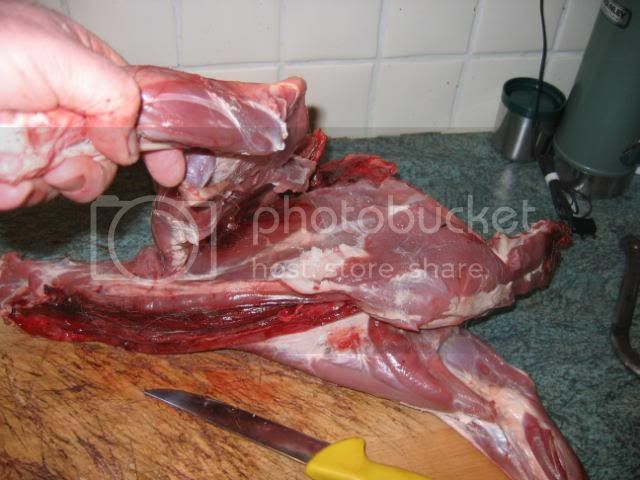 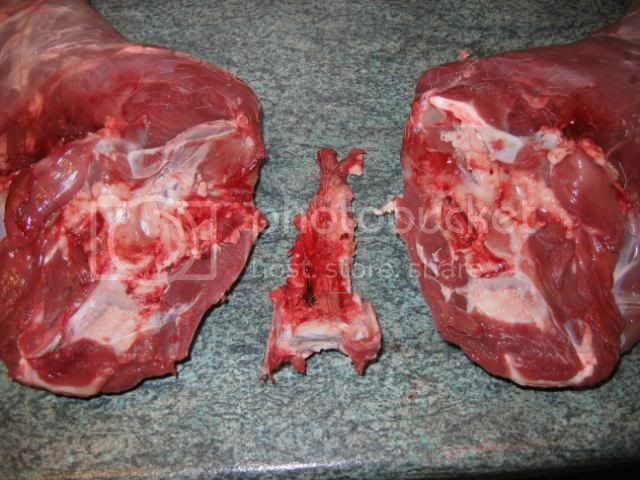 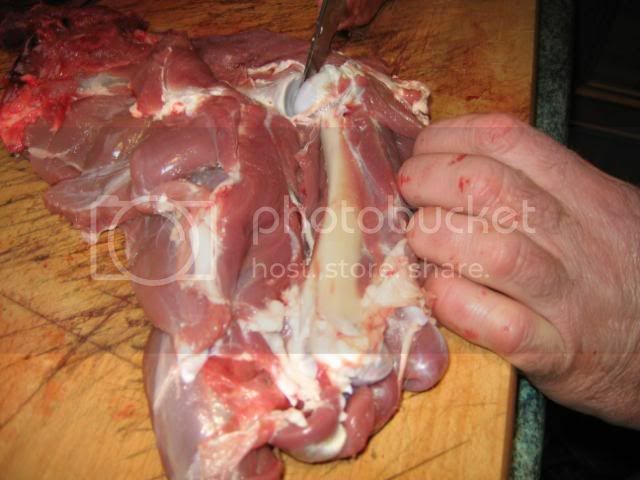 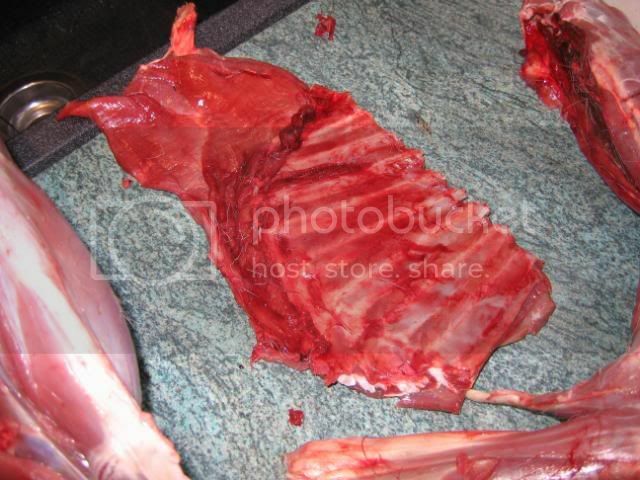 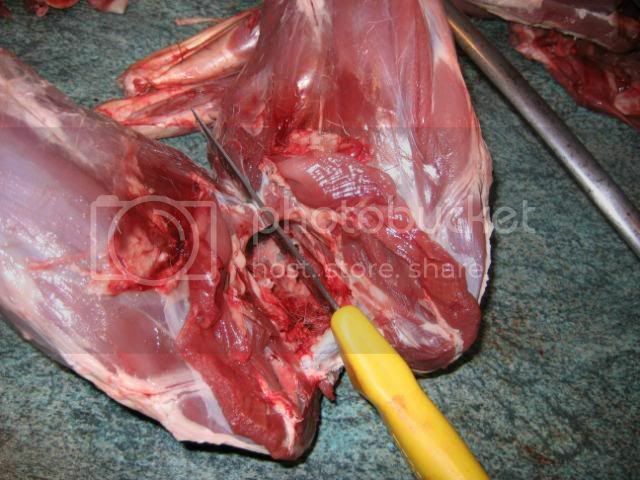 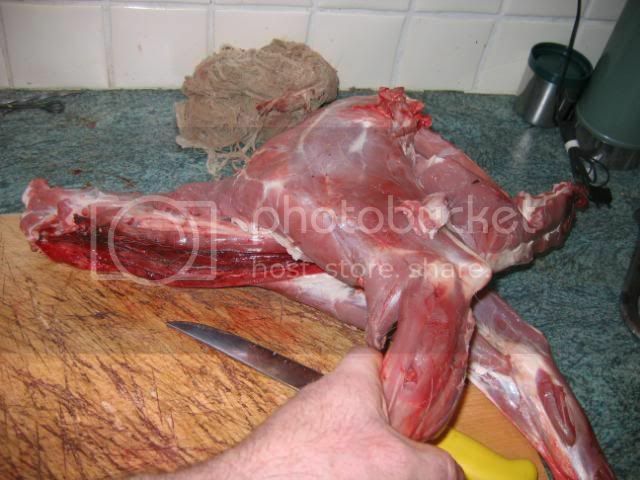 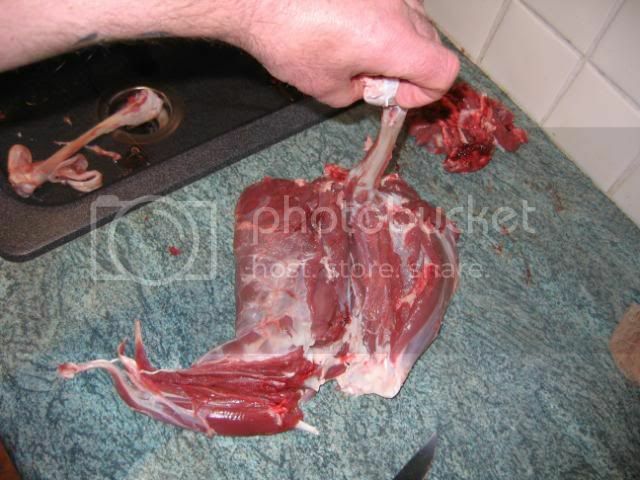 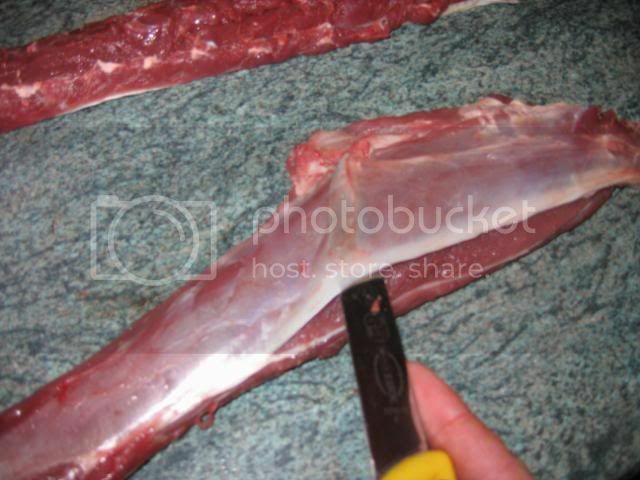 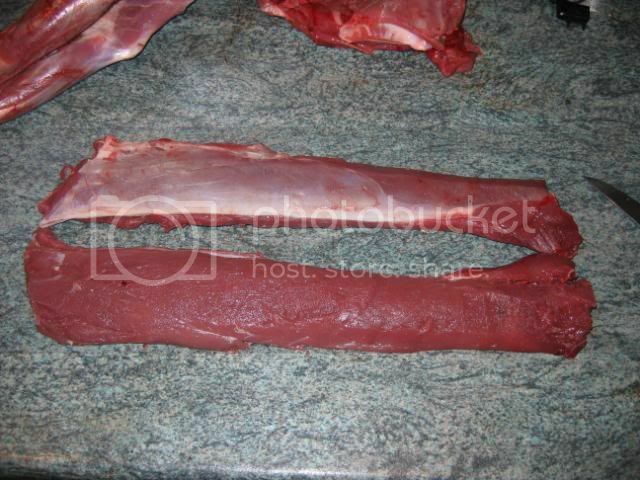 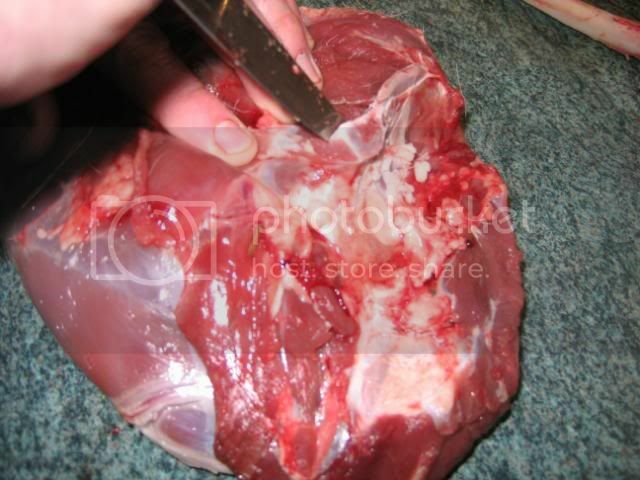 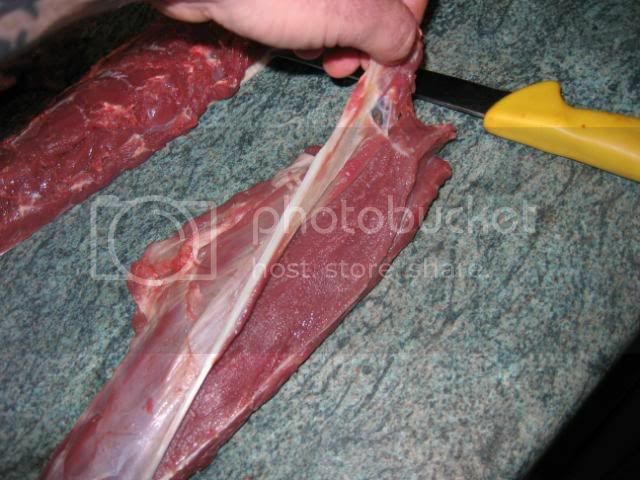 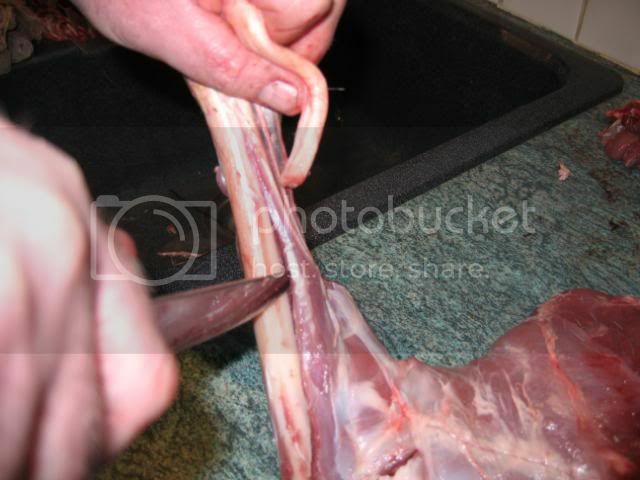 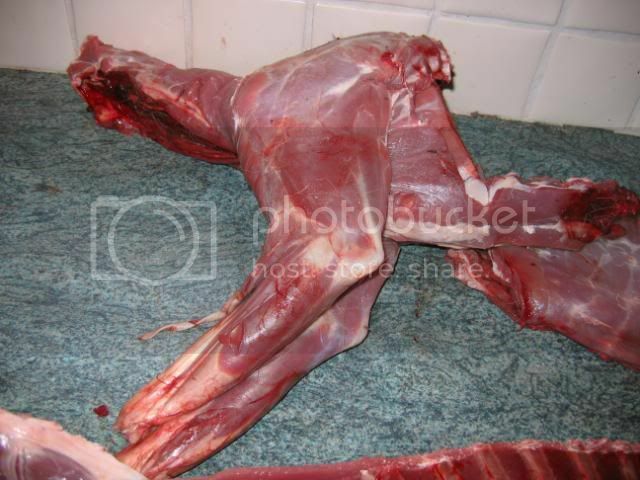 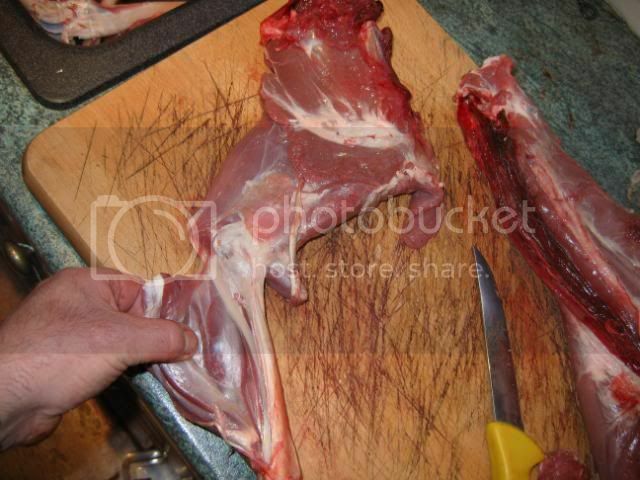 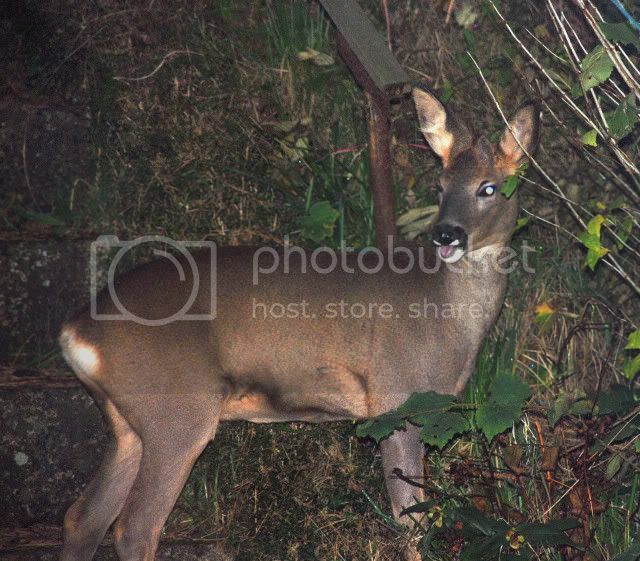 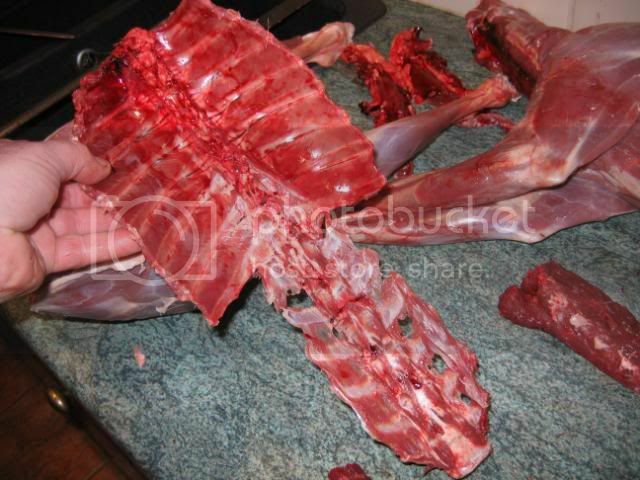 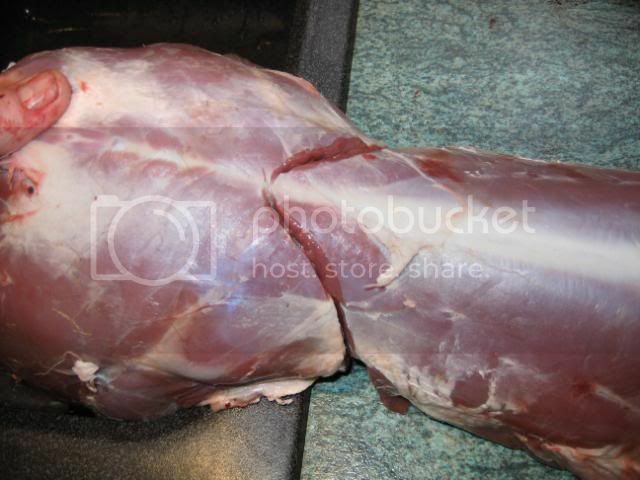 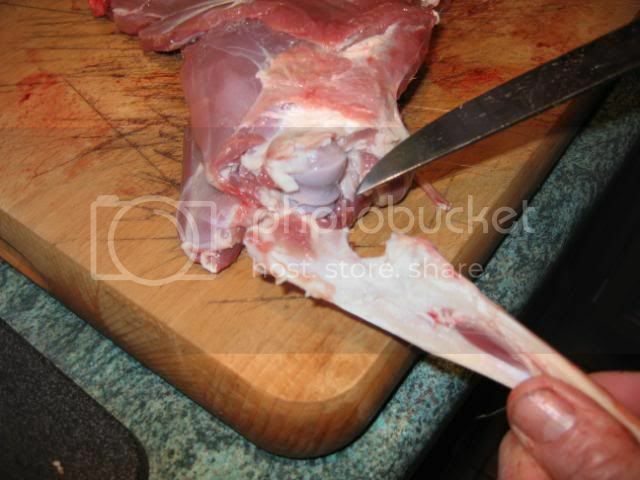 Right,I have put this together so it might be of help to someone while they are trying to butcher their Deer,this is a Roe in the pics,but,it would be exactly the same for all species of Deer,and,it just as easily be used on Lambs/Goats/Pigs.I have done this one with a view to using all of the fore meat for sausages,but,if you wanted to have casseroles,all you would need to do is to dice up the fore meat and bag in as big a lots as you would need to use on the day. 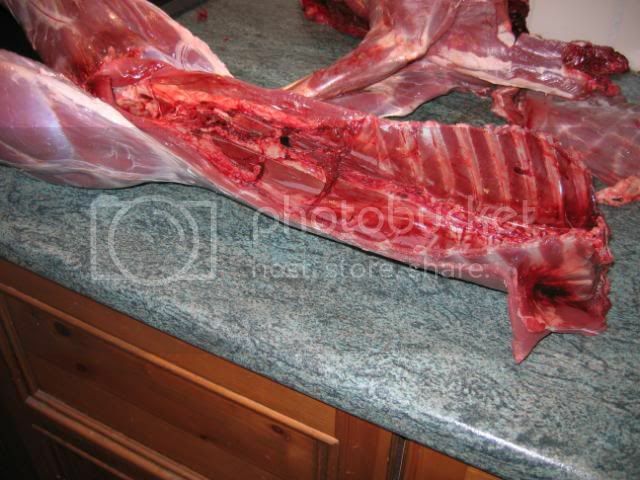 As I started to do this beast I was on my own,so,the skinning isn't very well illustrated,but,I will try to do another when I get one,and,have someone else take the pics.I was luckier later as I had help with the pics...........thanks Mum. 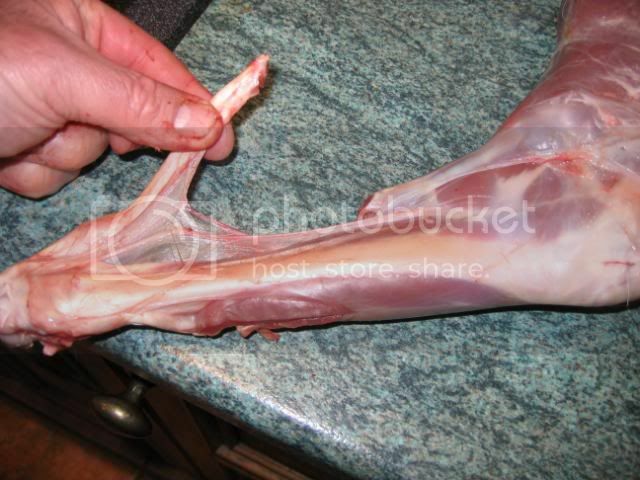 ,it should come off quite easily,so,just keep working your fist/knuckles into the skin,and,work upwards.When you have released the rear legs from the skin you just start to pull downwards still working the fist/knuckles inbetween to help it keep coming off.As you get to the forelegs you need to do the same as you did at the rear legs......put your knife under the skin facing outwards and run it down the leg towards the knuckle,you may have to ease the skin off woth the aid of a knife just nicking the vellum inbetween the carcase and the hide as you go.Once you have cleared both of the forelegs,you just need to pull the skin on down and off at the neck. 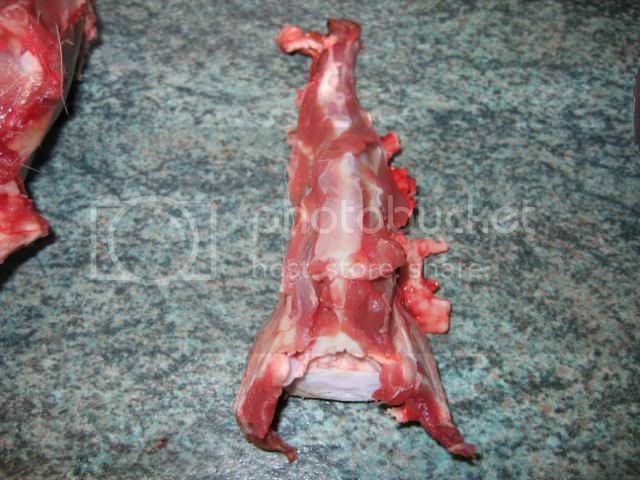 I usually have two dogs by my side while I am doing this and they get the fatty covering as a treat. 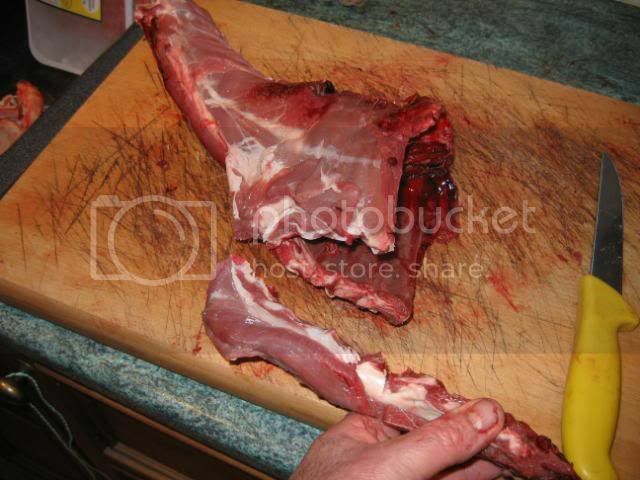 Now at this point I had a little friend join me to see what I was up to.......a 'Ked' Uurgh! 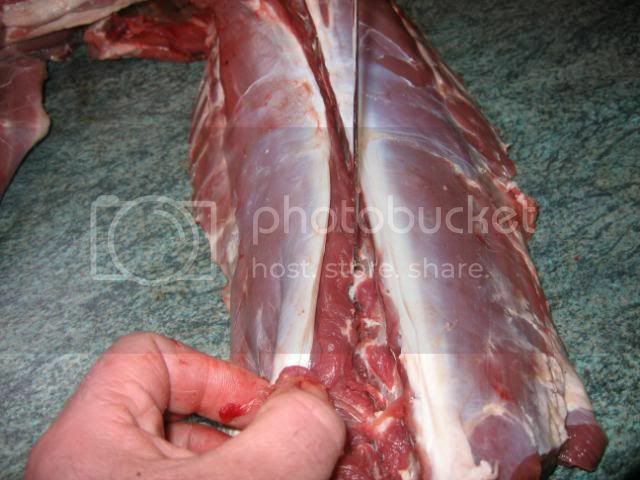 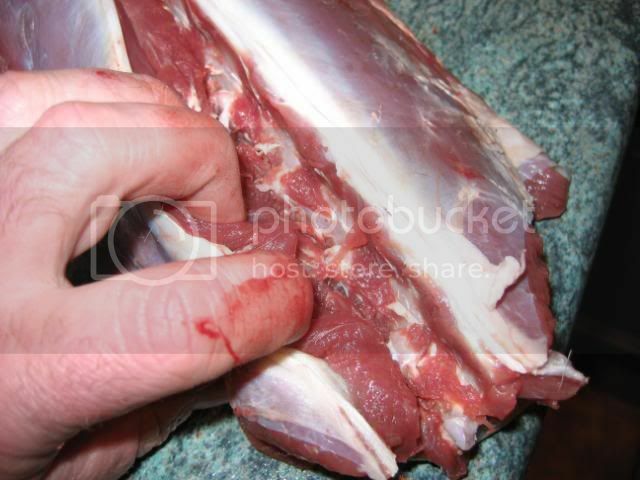 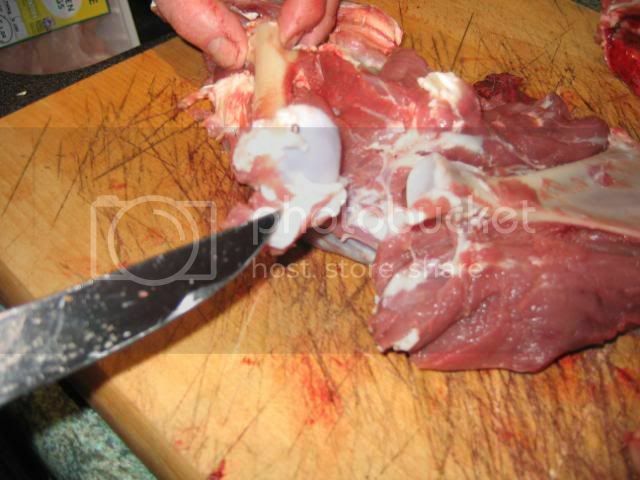 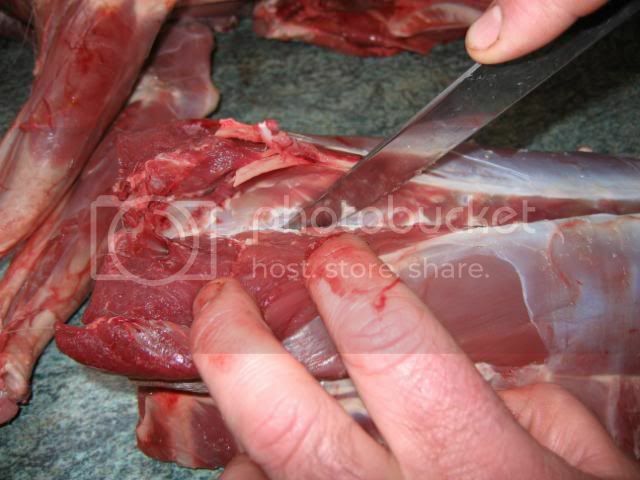 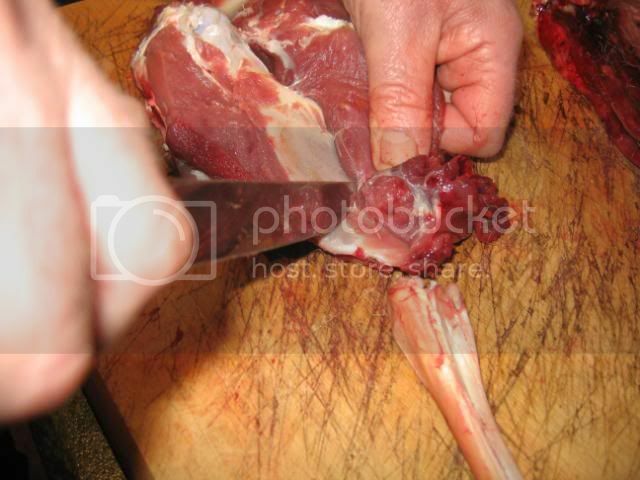 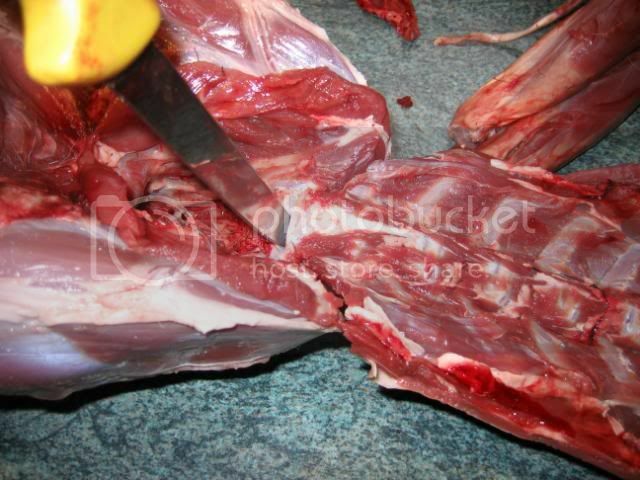 We then spin the haunch around and start to remove the aitchbone,this is a ball and socket joint,and it is VERY tight,so watch your fingers. 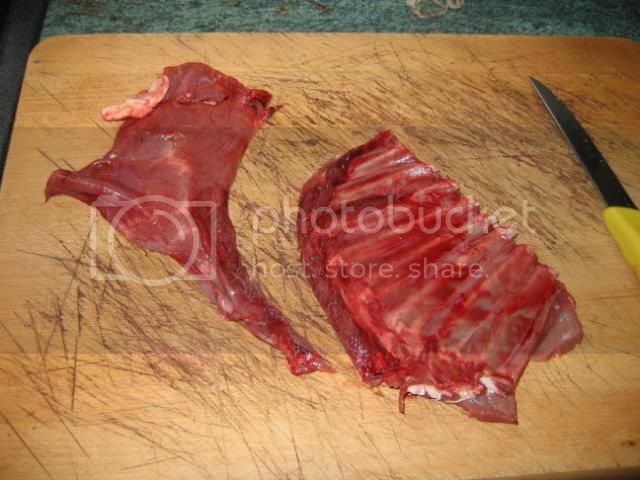 And here is an alternative to taking off the backstraps for those that like chops,I just sawed across the saddle to make some really nice thick double chops......mmmmmmmmmm! 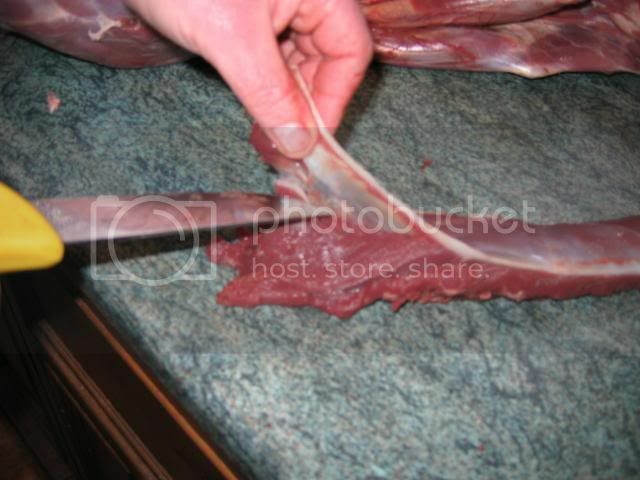 I do hope this will be of some help to some of you,and,if you have any questions please ask away.............Martin. 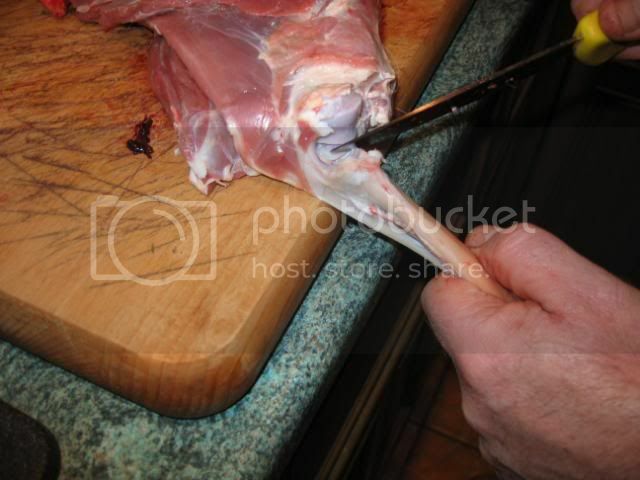 Excellent stuff as ever Martin. 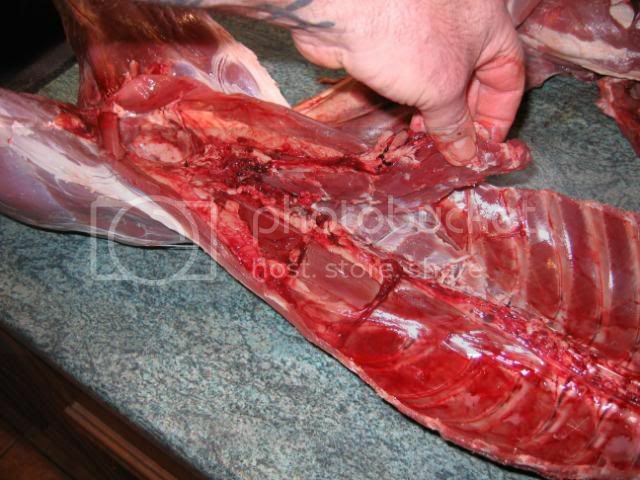 Spot on Martin fiar dues to you that took a lot of time and effort to put up in such detail great post. 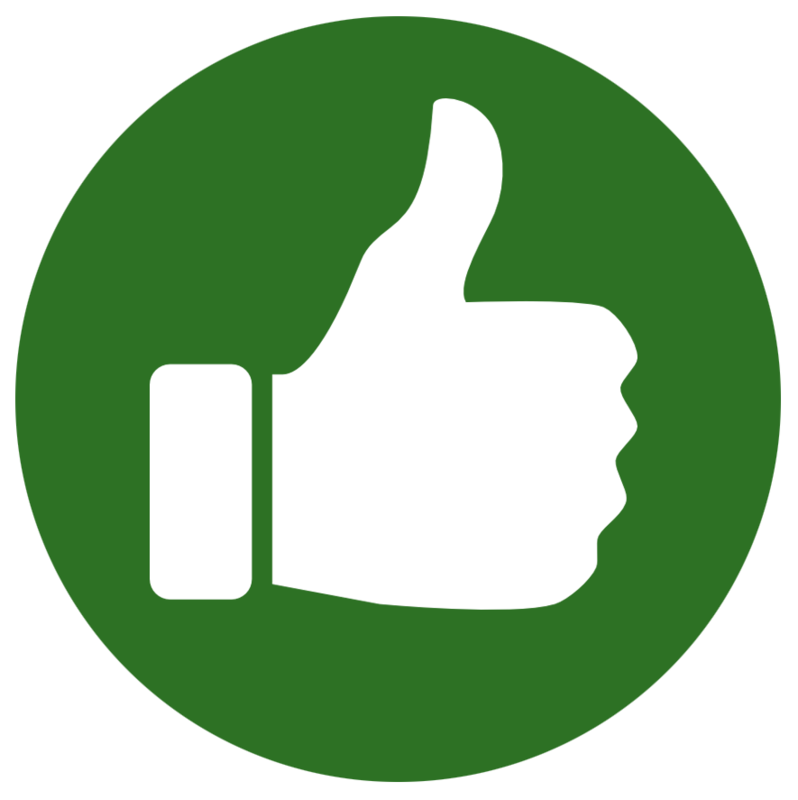 Nice write up, really useful. 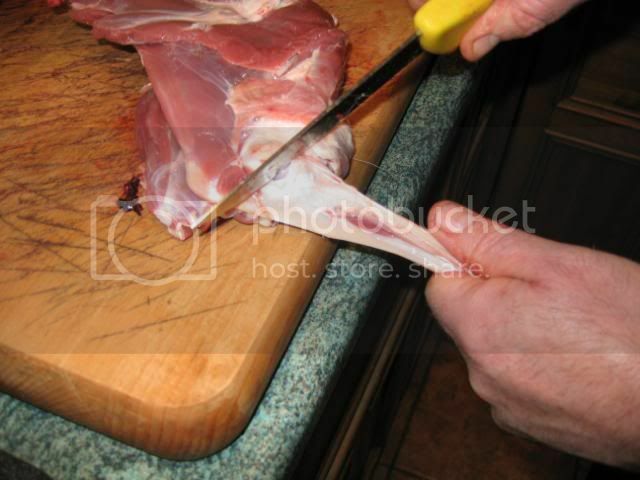 Ps Hows the silver fish collection coming on and did you get that other place? . 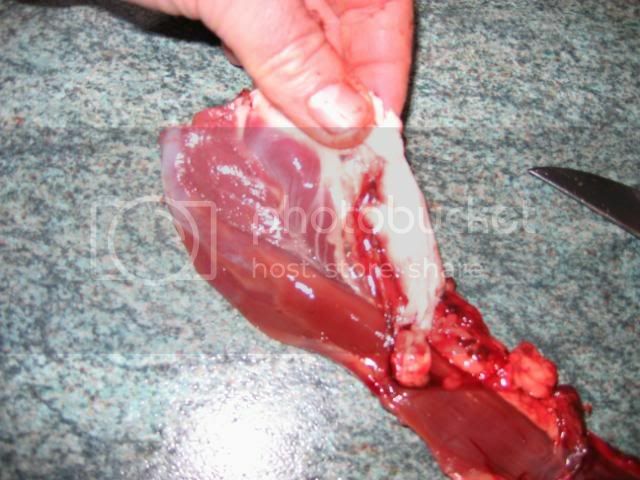 Thanks a lot Martin,good to see it in steps like that,atb NID. 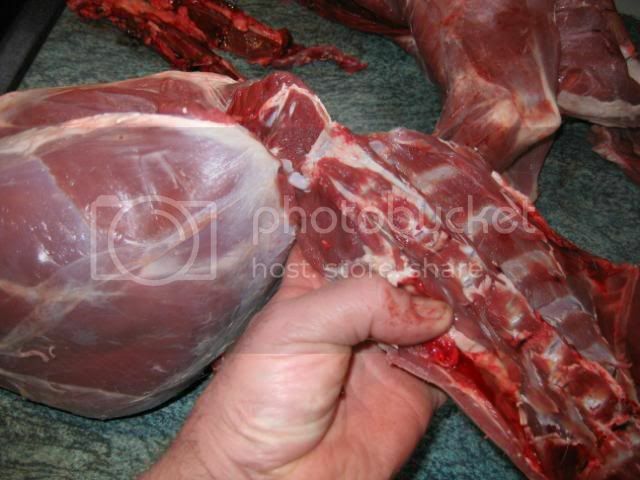 Just a to say excellent work ive "processed" a few deer now and having followed your pics etc i have found that ive employed a mix and match method, butthatks to your hard work i will be following your method ...stright forward, well explained and more importently it works. 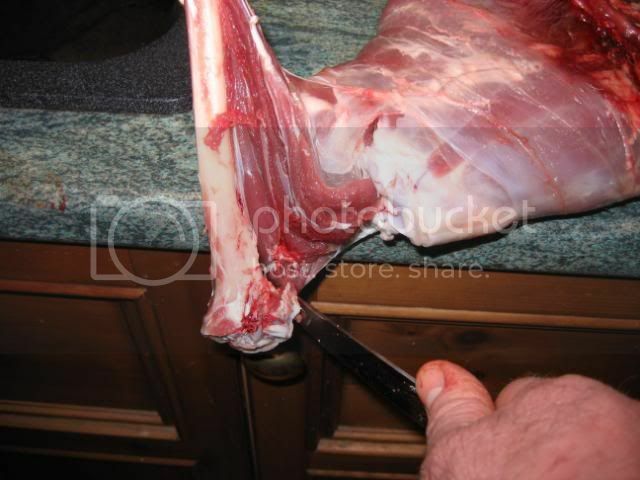 That will be very usefull for me Martin, ive never been too fussy about removing the bones from my roasting joints before, but im going to give it a go now! 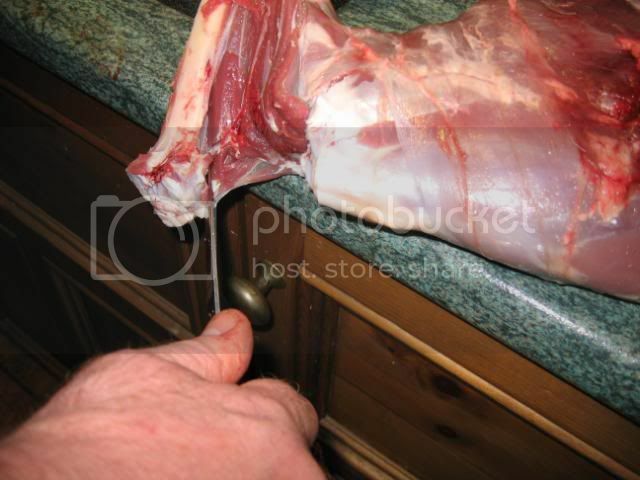 Plus it will save space in the freezer aswell. 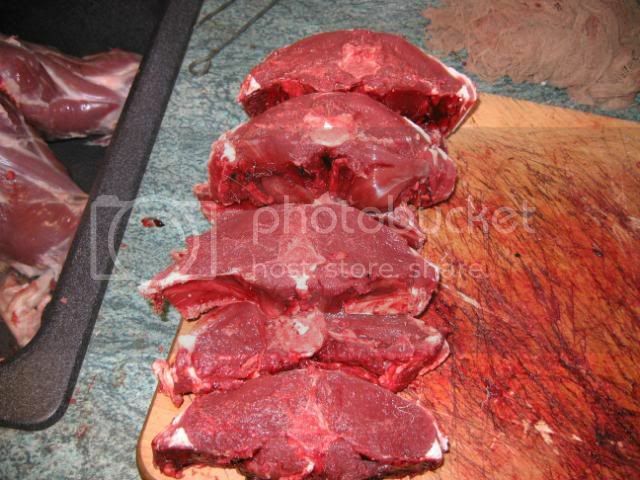 I have yet to hear back from the bloke,but,thanks for reminding me mate,I will ring him Monday.